The triangles of the neck are for surgical purpose andare studied in order to understand the complex and delicate contents that are found in this region. 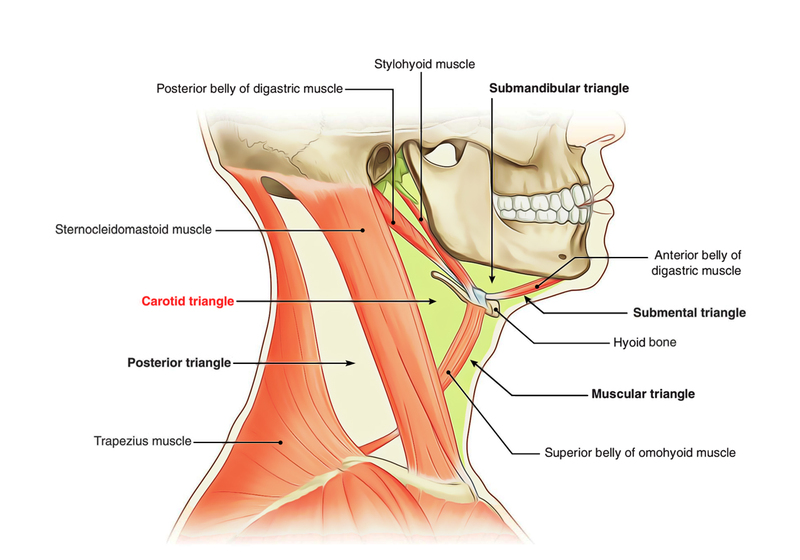 Inside the anterior triangle of the neck, the carotid triangle is among the paired triangles that are based on important landmarks. Carotid Triangle is named because all the three carotid arteries – common carotid, internal carotid, and external carotid are located within it. Superiorly, it is bounded by posterior belly of digastric complemented via stylohyoid. Anteroinferiorly, Superior belly of omohyoid. Posteriorly, Anterior border of sternocleidomastoid. Roof is created by covering layer of deep cervical fascia. The superficial fascia consists of platysma, cervical branch of facial nerve as well as transverse cervical nerve over the roof. External carotid artery and its first five branches. Carotid sinus and carotid body. Cervical part of the sympathetic chain.